Ryan Martin battles for yardage during Butler’s game versus Piqua on Friday night. Martin ran for a team-high 139 yards on 23 carries and scored three touchdowns. Butler’s Mason Motter battles for yardage versus Piqua. Motter rushed for 120 yards and scored a touchdown in a 27-25 Aviator victory. The Butler football team honored seniors Nicholas Coyle, Mason Motter, Nicholas Murphy, Brad Daily, Bryant Johnson, Andrew Boren, Blake Ross, Braedon Norman, Jackson Akers, Ryan Martin, Connor Hendricks, Ashley Brady, Quentin Glover, Josh Hurd, Charlie Dent, Dillon Buchanan, Grant Grisez, Ben Sipos, Will Long, Dylan Mitman, and Andy Thomas prior to the Aviators’ final home game versus Piqua on Friday night. 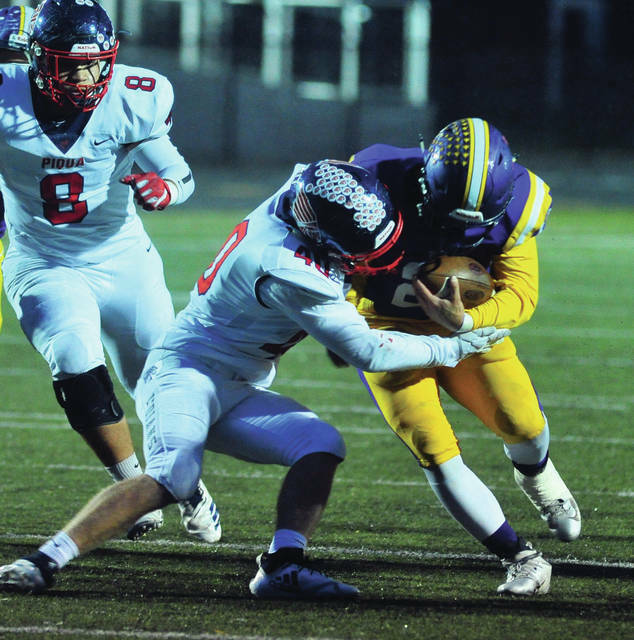 VANDALIA — Butler’s football game versus Piqua was a tale of two halves. After dominating the first half over Piqua and building a 27-0 lead at half, the Aviators had to survive a second half resurgence by the visitors to escape with a 27-25 win on Senior Night. The win lifted the Aviators to 5-3 overall and 2-1 in Greater Western Ohio Conference North play and, more importantly, provided a significant boost to Butler’s playoff hopes. Piqua also fell to 5-3 overall and 2-1 in league play. It was all Aviators in the first half. Ryan Martin scored the first Butler touchdown with 7:08 to play in the first half from a yard out. He added another less than three minuts later from five yards out and two Andrew Boren kicks had the Aviators up 14-0. They extended that lead to 21-0 on a six yard run by Mason Motter and another kick by Boren. Three minutes later, Martin took a handoff from Motter and scampered 74 yards and the Aviators led 27-0 heading into halftime. Piqua flipped the script in the second half. Despite the fact Vandalia was not able to make a first down in the second half until there was 14 seconds remaining, the Aviators were able to hold on for the win. Piqua went 66 yards after taking the second half kickoff. Quarterback Mick Karn ran 23 yards on a third-and-21 play, then ran 17 yards for the touchdown. Karn’s PAT kick got Piqua within 27-7. Vandalia fumbled three plays later and Zane Beougher recovered the ball at the Vandalia-Butler 30. Karn completed a 14-yard pass to Ca’Ron Coleman on a second-and-13, ran for two yards on fourth-and-one from the 10 and ran six yards for the touchdown two plays later. The PAT kick failed leaving the score at 27-13. Two plays later, Vandalia fumbled again with Coleman recovering at the Butler 32. On a fourth-and-five from the Vandalia 14, Karn rolled left and ran all the way to the end zone. The run for two failed and Piqua trailed 27-19 early in the fourth quarter. Three plays later, Vandalia fumbled again and Owen Toopes recovered at the Aviator 26-yard line. After Jerell Lewis ran five yards, Karn ran it in from the 21-yard line. Again, the run for two-points failed and Piqua trailed 27-25 with 7:58 remaining. Martin finished with 139 yards rushing and three touchdowns for the Aviators while Motter ran for 120 yards and a score. Butler will travel to Sidney (4-4, 1-2) on Friday seeking their first winning season since 2015. Kickoff is set for 7 p.m.
Butler’s Ryan Martin was tackled on his two-yard line on the kickoff and the Aviators were forced to punt from their end zone. But, Boren was able to boot a 52-yard punt to Piqua’s 39. Karn ran for 17 yards on the first play. On the next play Coleman ran for 18 yards, but while his forward progress appeared to have stopped well before the ball came out, the officials ruled a fumble and Vandalia took over on its own 26. Again, the Aviators could not pick up a first down, but Boren’s punt pinned Piqua back at its 15-yard line with 2:15 remaining. 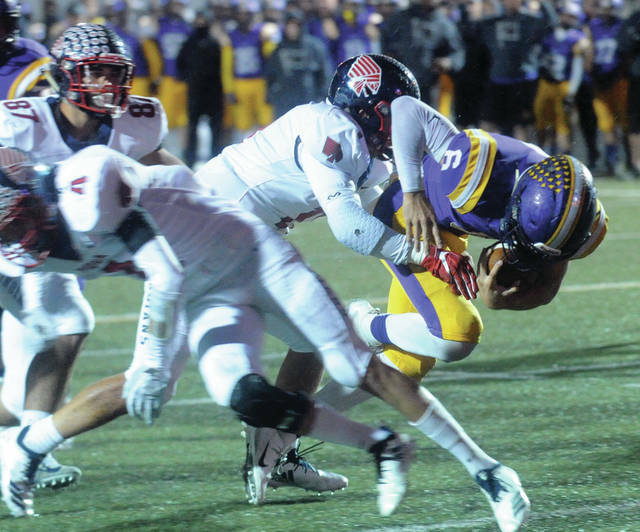 But, Vandalia’s defense rose to the challenge, as Piqua couldn’t pick up a first down and Vandalia ran out the clock.